AUSTIN, Texas – Nov. 14, 2017 – Single-family home sales increased across the Austin-Round Rock Metropolitan Statistical Area (MSA) in October, but declined in the city of Austin, according to the October 2017 Central Texas Housing Market Report released today by the Austin Board of REALTORS®. Single-family home sales in the Austin-Round Rock MSA increased 2.2 percent year-over-year to 2,292 home sales in October 2017. During the same time frame, single-family home sales in the city of Austin declined 1.7 percent to 699 home sales. At the county level, home sales volume increased 1.4 percent year-over-year to 1,124 home sales in Travis County, increased 5.4 percent to 794 home sales in Williamson County, and increased 6.2 percent to 274 home sales in Hays County. Housing inventory levels continued to edge upward across the five-county MSA in October, increasing 0.2 months to 2.8 months of inventory. In the city of Austin, single-family housing inventory increased 0.1 months to 2.3 months of inventory. Housing inventory levels across the region continue to be well within a seller’s market, compared to the Real Estate Center at Texas A&M University’s estimation of 6.0-6.5 months of inventory as a balanced housing market. Gains in housing inventory throughout 2017 have been partially driven by strong housing development throughout much of the region. The Q3-2017 Austin Housing Report by Metrostudy released last month reported that new home starts in the trailing 12 months ending September 30, 2017, are at a 10-year high, with a majority of housing development activity concentrated in local markets surrounding Austin such as Pflugerville and the west side of Cedar Park/Leander. Home prices continued to rise at a steady pace in October 2017. 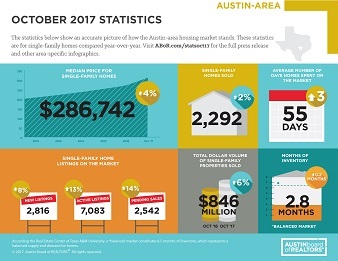 The median price for single-family homes increased 4.3 percent to $286,742 across the Austin-Round Rock MSA and increased 9.1 percent to $360,000 in the city of Austin during October. The Austin Board of REALTORS® (ABoR) builds connections through the use of technology, education and advocacy to strengthen the careers of its 11,000 members and improve the lives of Central Texas families.